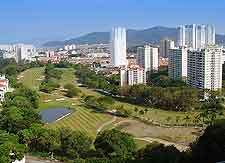 The tropical climate of Penang boasts consistently hot weather throughout the year, seeing temperatures hovering around 31°C / 88°F or 32°C / 90°F, month on month. Whilst there can really be occasional heavy rain showers at any time of the year on Penang, rainy weather is at its most likely during April and May, and again during the months of August, September and October. In particular, the south-westerly monsoon tends to arrive in Penang in both April and September, bringing with it the worst of the windy weather and rain. 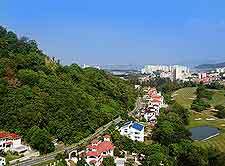 However, even the most torrential of a downpour does tend to be short-lived on Penang and sunshine is never far behind, with the climate remaining hot. Humidity is also fairly high and so you will appreciate an air-conditioned hotel room during the warm nights of your holiday. The island's appealing climate is greatly influenced by the surrounding sea and Penang's relative proximity to the neighbouring Indonesian island of Sumatra. During the very hottest of weather, temperatures regularly soar to 35°C / 95°F or more, making this the perfect destination to shake off the winter blues. Christmas time is always busy on Penang and part of the high season, with crowds of tourists arriving in search of Malaysian heat and sun-drenched beaches.